This is a Sponsored Post written by me on behalf of iCoke.ca. All opinions are 100% mine. In participation and supporting of the 21st Winter Olympics (2010 Winter Olympics) which will be held on February 12-28, 2010 in Canada (this will be the 3rd Winter Olympics hosted by Canada), Mac's Store is giving giveaway to the Coca-Cola product consumers. 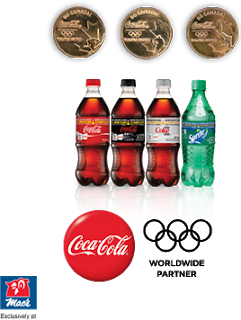 When you purchase two(2) of 591ml Coca-Cola products at any Mac's Store outlet, you will receive one of three FREE Coca-Cola Collectible Medallion . This offer is valid exclusively at Mac's Store around Canada from January 4, 2010 - February 28, 2010 (January 6 - March 2, 2010 in Quebec and Atlantic provinces). All you have to do is locate Mac's Store near you so you can get the giveaway. Take note that this giveaway is subject to availability so better get it as soon as possible. I love coke ever since it was introduced to my taste. As I was a child, I could only drink sodas when there were special occasions like birthday, Christmas, New Year, and others. It was not present on ordinary days and when I can have it, coca-cola products were always on the table. Time to time as I grew older, I appreciate its taste more than the other products albeit of the price range. And so it became my favorite soft drinks of all time--coke or sprite; royal (true-orange) with crackers for snacks whenever I got sick. Nowadays that soft drinks are usual in our home, I make sure that when I goes to the store I got coca-cola products only. I love Coca-Cola products so much and whenever I have good news, I will pass-on to you so you too can enjoy what it has. So, if you live in Canada, grab the opportunity of FREE Coca-Cola Collectible Medallion at the same time enjoying the taste.